I am a lot of things, but low maintenance is not necessarily one of them. Straight up, I am a girl with some constant cravings. Though I try to savor life moments with gratitude, I fail all the time. Why do we desire God’s presents in our lives more than His presence? Isn’t that what we do when we stomp our feet before His throne and whine about all of the things that need fixing instead of praising Him for the strength He graciously gives us to get through? While we’re certainly encouraged by Scripture to make our requests known to the Father (Philippians 4:6), the highest calling on our lives is to love God with all of our hearts, souls, bodies and minds (Matthew 22:37). We can do both, but we are commanded to seek God first: to look to Him as our Ultimate. Our Portion. The Bible shows us time and time again that when we prioritize God – when we look to Him to be our Portion – we are supernaturally equipped to rest in Him. Do you remember that old hymn His Eye Is On The Sparrow? Girlfriend, God doesn’t miss a trick. He knows what’s going on. Dear Lord, Would You be my Portion today? Help me to trust Your plan and rest in Your grace – beyond what I see or feel. Consider these questions. How has God met your needs in the past? Do you trust that He is able to meet them today? Let’s take the conversation deeper. Click here to tell me what that might look like for you. Are you struggling to trust that God can actually be your Portion? Think His promises are for everyone but you?Learn how God wants to bring you beyond your past heart-wounds and your present challenges to His wholeness, strength and beauty. 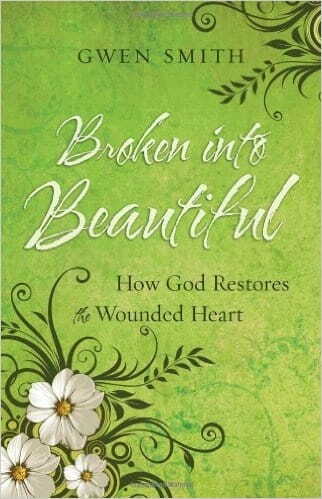 Broken into Beautiful is a book filled with stories – real stories … gritty and honest, not cleaned up and phony. It’s also filled with Scripture that will inspire you toward the life-changing grace of Jesus. To order the book, go to Amazon or, for a signed copy click here.